Beautiful colors! Perfect for my daughters room. She thinksot is soft and very cozy. Would definitely recommend. The pillow that came with it were cute as well. Revitalize your bedroom with the chic style and comfort of Intelligent Design's Lou Printed Reversible Comforter Set. Horizontal stripes, made of various geometric motifs, are flaunted in refreshing coral and grey hues and pop against the crisp, white ground. The comforter fully reverses to a geometric pattern, allowing you to easily change up the look of your bed. Matching sham mirrors the design of the comforter, while two decorative pillows with embroidery and fabric manipulation provide the finishing touch. Made from ultra-soft microfiber, this reversible comforter set is machine washable and will gives your bedroom a charming, casual appeal. 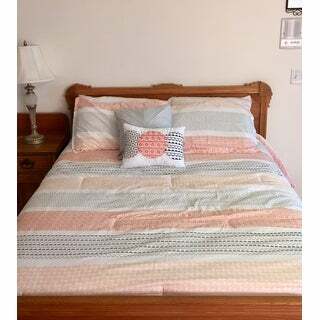 The Coral printed comforter set is a really great buy for a guest room or a room that will not be disturbed often as the comforter does easily snag and isn’t the best quality but I knew that with the price. It was exactly the color combination I needed though of grey with coral. Love this comforter set. The guest room is done in deep coral and this set is perfect in there. Not too heavy fortunately since I live in the south, but it's not a thin light weight either. The colors are very pretty and go well with the room. My granddaughter took her comforter set home and put it on her bed right away. My son told me that she really loves it and that it just matches the colors in her room perfectly. He said , that she told him Grandma always knows what to get me even if I say it looks okay and it turns out beautiful daddy !! I cried when he told me , can’t wait to see it . I like this set as it washes up nicely, the colors are pretty much what you see advertised, although maybe not quite as light. The set also seems to be decently well made, especially for the price. The fabric is more of a silky feel and less of a cotton feel, and you do have to wash and dry on the cool settings. Perfect for college dorm room!! The colors match perfectly with a room I just redecorated..I hope.